I'm embarrassed to even admit how much time I've spent on Pinterest this summer. I always plan on just looking for a few cool ideas after the kids go to bed, but the next thing I know, it's 2 a.m. and my mind is spinning with all my new "pins" and the fun I'll have with them. The downside is that the kids have to deal with a tired mommy the next day, but the upside is that I find cool ideas like THIS Lava Lamp. As soon as I saw it, I knew it would make it onto our Summer must do list. I suspected my kids would get a kick out of it and they did! 1. Gather your supplies ~ cooking oil, water, food coloring, an empty water bottle, and Alka Seltzer antacid tablets. Oops, the Alka Seltzer tablets didn't make it in the picture. 2. Fill your bottle about two thirds of the way with oil then fill the rest with water, leaving about an inch free at the top. It was fun adding the water and watching the layers separate. ** NOTE ** We liked watching the water layer "sink" to the bottom, but we had to wait awhile for the bubbles to disappear for the next step. Adding the water first, then the food coloring and finally the oil, wasn't quite as fun, but it was a bit faster. Mommy adds the food coloring. 4. Take an Alka Seltzer tablet and break it into 3 or 4 pieces. Then drop a piece in and watch the magic. The kids are looking annoyed that I made them stop for a picture first! 5. As soon as the tablet hits the layer of water, it will start to fizz and the colored water will erupt! 4. The bubbles will stop as soon as the tablet dissipates, but it will start up again as soon as you add another tablet. If the oil layer starts to become cloudy with tiny bubbles, just let it settle for awhile and then you can do some more. My kids loved it so much they worked really hard to be good so they could "earn" more antacid tablets to do it over and over again. That's pretty cool :) It's amazing how much fun stuff mom's find or do late at night. How fun!! Alkaselters just got added to my shopping list! That is awesome! My daughter and I are definitely going to do this! Thanks for sharing. 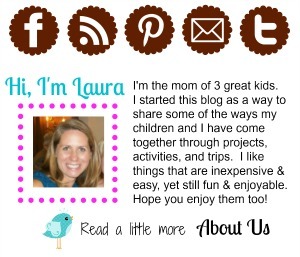 I came across your blog on Tip Junkie...What a cool idea...my kids will love it! I would love it if you would come by on Friday and link up! That is pretty sweet, you ALWAYS have the funnest, ideas, we will have to try this out! As always... a great idea! My oldest did this at a science camp this summer and my kids sure got a kick out of it. What a great idea! I love this Laura! Gotta go buy some antacid tablets! This Rocks! I love seeing your kids annoyed because you made them stop for a pic! I get that a lot with Miss Sassy! I loved seeing this step by step. So cool! I pinned it to my board on Pinterest. I gotta try this with Henry. We've attempted a water and oil bottle once without much success, but the addition of the tablet will make this much more fun! Thanks for sharing on It's Playtime! Brilliant!! we are on our long school holidays now, so I'm going to be trying this one out !! Coolest project EVER!!! We're so going to do this! Thanks! This looks like tons of fun! We may have to try it! Stopping over from the Sun Scholars Linky and am a new follower. I love this activity and know my son would too! Thanks for sharing! Very fun! I remember doing something like this when I was little. :) Thanks for sharing, my little guy would love this! Found you on TT&J, I'm you're newest follower. 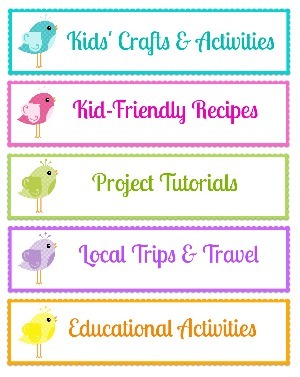 Would love for you to check out my blog http://domesticcharm.blogspot.com and follow back if you're interested! oh, love it! thanks so much for sharing on Craft schooling Sunday! This is a great to keep kids entertain for hours.. Very clever idea! I posted a link to this on my blog: http://thecraftbarn-ny.blogspot.com/2011/12/crafty-friday-121611.html thru my pinterest board. Love this idea. Pinned it to my Sensory Play board on pinterest. Do you have to leave the lid off the bottle? You don't have to leave the lid off. We did just because the bubbles start almost immediately and the kids didn't want to wait for me to screw the lid on first. However, if you're worried about it spilling, you can put the lid on. There will be some carbonation from the tablets, so if the lid is closed, expect a little release of the gases when you reopen the bottle (similar to opening a bottle of soda) but I don't think the pressure would build up too much unless you put in several tablets at once and keep the lid on. Hope that helps. I work at an after school program and did this project with 13 lucky kids. They loved it! And so did their parents! Thanks!! If you have a minute I would love for you to visit and link it up to my party. I hope to see you there! I've just had a great day with my seven-year-old grandson - his reaction to this was "WOW!" and when mum and sister came to collect him their reaction was the same! Great fun and we could screw the top back on and he it took it home to show dad too. Ten out of ten for this. I didn't have antacid so I used clear vinegar instead of water and added baking soda with similar results. 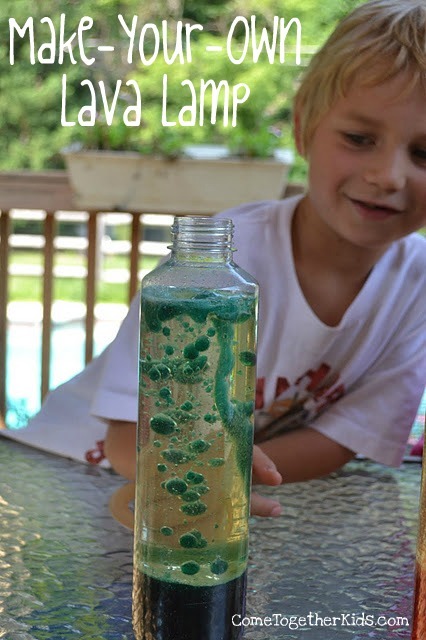 Definitely doing this with my son :) Do you recommend new water and oil each time, or can you cap and store for awhile? You can definitely cap and store for awhile. We've kept them for months before. Plus, if it's tightly capped, it's fun to just tilt the bottle and watch the contents slosh around. is it something that the kids can take home with them ? Yes definitely. Just wait for it to stop "erupting " then put the lid back on it. You can give them directions to use more alka seltzer tablets or it's fun just to move it back and forth and watch the waves of oil and water. Oh no. I'm really not sure of another substitute. Have you checked the pharmacy department of your local store? If not, it's still pretty neat to just have the colored water and the oil. It doesn't erupt, but it's fun to shake, then watch the two separate again. Just use salt! I did this with my middle school science class & we simply sprinkled salt on top. We did ours in a jar instead of a bottle, so the salt was easier to sprinkle on top. Once the salt hits the oil layer it will start to react & cause a similar effect. Awesome does it last long? The bubbling effect just lasts for about a minute (depending on the size of the tablet you put in), but the actual liquid in the bottle can last for a really long time! hi im 9 years old and i did the project with my sister it was AWESOME!!!!!!!!!!! THAT WAS ONE OF THE BEST PROJECTS I'V DONE I MIGHT DO ANOTHER ONE OF YOUR PROJECTS ANOTHER TIME BYE!!!!!!!!!!!!!!!!!!!!!!!!!!! I'm so glad you liked it! Isn't it fun? Let me know what other projects you try. I just made this with my 8 year old son. It was much cooler than I expected. He really enjoyed it and wanted to share with the whole family. We tried this with regular antacids and it didn't work. We also tried salt, and it kind of worked but wasn't especially impressive. Can you use plastic bottles or does it have to be glass? these were amazing! however, after a day, the clear water looked very cloudy. any suggestions? Your children are so lovely! This is so much amazing .so,you can also visite my links. You may not have the exact level of proficiency required to modulate such reports and therefore, hiring a CDR writing services, is a clever idea. CDR reports reflect you competency standard to meet the relevant engineering jobs in the islands of Oceania. For the migrants, chances of rejection increase if the report is shabby and inappropriate. Only an expert touch guarantees that your CDR is absolutely appealing and impressive. Cdr Engineers Australia must be a clean and precise report without even a single mistake. For immigrants, expert service is the best option in order to ensure that the report is free from errors. Experts, having good hold on the language, prepare the drafts with utmost proficiency. At Students Assignment Help we provide students with the best essay writing NZ. Our writers are experts in providing help on any essay topic that students ask for as we posses a great knowledge. Whether you need help with your college admission essay or MBA essay writing, our experts will guide you. IrelandAssignmentHelp.com is most trusted Homework Writing On Famous Personality service provider in ireland. Students has blind faith on our homework helper expert. Get homework writing help at cheap cost. SingaporeAssignmentHelp.com is experienced from decades in the filed of homework help services. Keep growing in academics with support of our expert homework helper who are always available to guide in any type of homework help at very cheap rate. Get discounted online assignment help services from our expert writers at any time. Really Great Post! I'm glad you read this post. Your information based on this great post helped me a lot. The original content of this post really attracts me very much. I hope you get more such a new post in the future. Thank you for your nice presentation. Losing sleep over unfinished essays but can't afford the assistance of costly essay writers? Wondering whether the online service providers will write my essay cheap in UK? Facing a deadline for finishing the essay? Well, your anxieties end here. We have with us a team of essay writing services for UK students who can solve all your writing issues so that you score high grades in your essay assignment. They will deliver the completed essay to you well before the deadline. With decades of experience in helping students, this team of professional essay typer best in UK. Hello guys ! How are you? Are you alone? Don't worry. I'm with you. If you want to sleep with me on bed with all physical love and entertainment, You shuold follow me on the links specified bellow. The above information you shared give me a new look at this topic. I am working as a full-time academic writer in myassignmentHelpsg providing Assignment Help Singapore services to college students. ABC Assignment Help is a group is astounding authors holding a capability and involvement in various subjects to give quality Kaplan assignment help to understudies over the world. We center around giving round-the-year support to enable understudies to get a handle regarding the matter and accomplish awards. Our administrations are constrained to giving task help as well as to help understudies from various schools/colleges to comprehend the rules and limitedness of different subjects. Are you looking for informative speech on various topics like media, economy, business, animals and more? Well, have informative speech topics with speeches within half an hour. nice information shared good work. Packers and movers in Delhi - We give vast importance to loading and unloading, because it is at this stage that damage to goods frequently occurs. Great information, Thank you for sharing and keep posting. Imagine a scenario in which you were informed that these gadgets were adversely affecting your general wellbeing and vision by transmitting an unsafe blue light. Get an impactful report for samsung corporations operations strategy. The Travelius, Best Holiday Packages. Get assignment help in UAE which is offered by studentsassignmenthelp.com on assignment help UAE in your suitable subjects according to your stream. Remove your assignment stress with us. Being an academic writer from past 5 years providing assignment help to college and university students also associated with AssignmentHelpShop platform. I am dedicated in providing best online academic writing services to the college students at the affordable rates. Ovo je jedan od sjajnih članaka. Hvala vam što ste podelili. Želimo vam sreću i uspjeh! Five Fun Ideas with Paint! Handstand Kids Cookbook Kit WINNER!!! !